He knows many things, for he walks by night! He knows the nameless terrors of which we dare not speak! 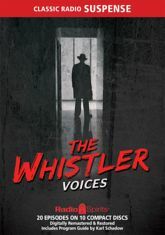 He's radio's grim conscience: The Whistler! And he's back with another collection of tense, twisting tales featuring some of Hollywood's finest radio talent! Though Bill Forman is the actor best remembered as the series' ruinous raconteur, there were others who shared the role. Their voices are heard in these strange stories, including Gale Gordon, Joseph Kearns, Marvin Miller, and Bill Johnstone.